This Healthy Strawberry Rhubarb Smoothie Recipe made with plain yogurt or soy yogurt screams "Summer"! Since rhubarb and strawberries are usually ready to harvest around the same time of the year, this recipe for a refreshing, healthy drink is a berry good idea! 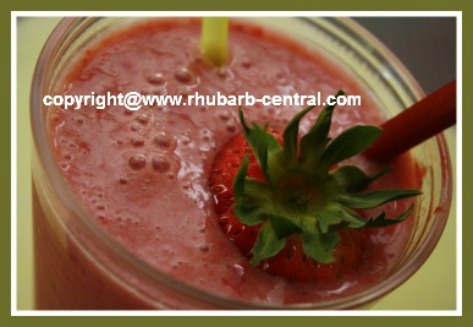 You can use fresh OR frozen rhubarb for this recipe, so if you have rhubarb stored in your freezer, why not take some out, and treat someone special to a delectable smoothie today? 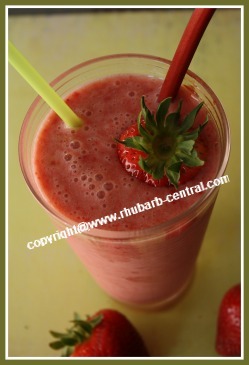 Combine the rhubarb sauce, strawberries, apples juice, yogurt in a blender and blend just until smooth. Serve immediately and sprinkle with **cinnamon, optional. Add a fresh strawberry on top for garnish. Smoothies are a great way to get kids to eat their daily fruit and vegetable requirements. Be creative, and add additional fresh fruit which is ripe in the area where you live. When making smoothies and shakes there are no "rules", just use a basic smoothie recipe, and add ingredients or specific types of yogurt, milk, or fruit which you prefer. For example, you can change any smoothie recipe to suit a particular diet of low fat, low sugar, etc. by substituting ingredients. You can also easily add whey protein powder to your fruit smoothie. Some recipes already include whey powder in the list of ingredients, however, even if it is not listed, you can add a scoop of whey powder to almost any smoothie you make. In fact, you can purchase different flavours (for example: "cocoa" flavour) of protein whey. The whey powder is considered "tasteless", so it does not interfere with the flavour of your food.